I’ve long held that the highway code is outdated in that it prioritizes the safety of drivers over the safety of pedestrians and cyclists. Now, some lawmakers are finally catching on. Allowing the “Idaho Stop” — which takes physics into account and legitimizes the widespread practice. Letting cyclists drive on sidewalks where their safety is compromised on the road and provided there’s no risk to pedestrians. Removing the requirement that cyclists stick to the “extreme right” of the road — where they’re more likely to be at risk from buses, taxicabs or “dooring”. Prohibit the use of mobile devices while cycling — this is common sense, or ought to be. Increase fines but eliminate demerit points for cyclists — this makes sense since not all cyclists have a driver’s license. As a sometimes-cyclist, sometimes-driver, sometimes-transit user and sometimes-pedestrian, I do see all sides of the issue. Yes, cycling is a healthy, eco-friendly way to get around. I agree that we should do more to promote cycling, and that the laws need to protect the safety of cyclists. Yes, there are some cyclists who break the law. But there are also drivers who break the law. And, yes, in both cases, it’s sometimes because they’re careless or reckless. But in many cases with cyclists, it’s because they’re trying to protect their own skin. Take, for example, left turns. Now, the law says that if I want to make a left turn, I have to move over to the left lane and then turn against oncoming traffic, just as a car does. But in many, many places in Montreal, that’s a fantastic way to get killed. So I — just like many other cyclists — often do the two-step turn, where I cross straight first, then turn into the crosswalk lane, wait for the light to change, and cross straight in the other direction. The highway code says I’m not supposed to do this. My sense of self-preservation says otherwise. Likewise with the Idaho Stop. Anti-cycling people will grumble about how it gives cyclists license to “break the law” by rolling through stop signs. But here’s the thing: Most stop signs are there as traffic calming measures, to get people to slow down in residential neighbourhoods. Traffic lights are typically deployed at larger intersections, and cyclists will still have to come to complete stops at red lights. But in most cases, cyclists are already going slowly enough that they don’t need to be “traffic calmed”. Moreover, stopping at a stop sign, hopping off your saddle to put your feet on the ground, and then starting again, takes a LOT more effort than merely pressing the brake pedal. Especially on the 50-pound Bixis. The laws of physics say that there’s little risk to allow a cyclist to slow down when they approach a stop sign, look both ways to make sure it’s safe to proceed, and then slowly roll through. Most do it already. Let’s legitimize the practice. The most controversial recommendation here is probably regarding helmets. Right now, there are no laws requiring adults to wear a helmet while cycling, and the report says we should keep it that way. Now, I wear a helmet when I bike, and I’d encourage everyone else to as well. I understand that in jurisdictions with helmet laws, the cycling rate drops, which is bad for the safety of all cyclists — and for public health. But I’m still pro-helmet just as I am pro-seatbelt. And I see how an argument could be made for both sides of this one. Overall, though, I’m encouraged by the recommendations in this report. 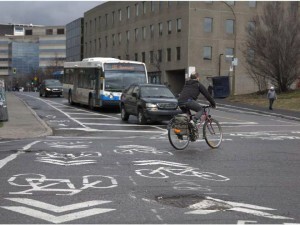 Let’s hope the province adopts them into law, so that Montreal can continue to serve as a model of cycling-friendly cities. Next post: Environment? We don’t need no stinkin’ environment.